Apart from the general and academic scholarships awarded by Minot State University, there are specific Division of Music scholarships available. The Division of Music offers more than 25 endowed scholarships totaling over $100,000 of awards each year. Each spring students may audition for scholarships for the following year. 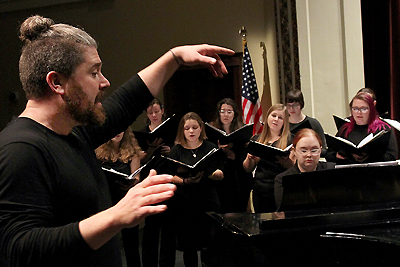 Awards are available to music majors, music minors and ensemble participants. All scholarships are renewable for up to five years. Bert Skakoon String Scholarship--Awarded to the outstanding orchestral string students who attend MSU. Recipients must perform with the Minot Symphony Orchestra at all rehearsals and concerts. Blanche Lynch Memorial Scholarship--Established through contributions by the late Mrs. Thomas W. Leach of Towner, North Dakota, and Tulsa, Oklahoma. One scholarship is available each year to an outstanding junior for the senior year in vocal or instrumental music. Recipients of this scholarship must be music majors. Evelyn Sampson Music Scholarship--Awarded to piano students demonstrating exceptional performance accomplishments as determined by the recital committee. Fishpaw/Krohn Scholarship -- Established in 2011 for male vocal students. Gary Stenehjem Organ Scholarship -- Awarded to organ students. Gay Gidley King Scholarship--Established in January 1994 in memory of Gay Gidley King. Student must be a piano student. This scholarship is based on the students ability and financial need. Harvey & Arlone Twyman Scholarship--Awarded to music majors. Ira Paul Schwarz Scholarship--Established in 2008. Awarded by the MSU Music scholarship committee. Lyle C. Hanson Scholarship--Established through the estate of Lyle C. Hanson to provide scholarships to students in music education. John and Patricia Strohm Music Scholarship--Established in January 1995 in memory of John Strohm, professor emeritus of music. John Strohm was at Minot State University for 35 years in various capacities to include voice teacher, performer, conductor, classroom teacher, and administrator. He directed the MSU Concert Choir from 1951-1974 and the MSU Women’s Chorus from 1962 until 1974. He directed the annual Christmas performance of Handel’s Messiah for 24 years. An associate professor of music, he became the chairman of the Division of Music in 1961 and retired in 1986. Student must be enrolled full time as a music major, possess a cumulative grade point average of 3.0 or higher, and preferably be a student of vocal music. Students studying a musical instrument may also be considered. Dr. Joseph Hegstad Scholarship--Established in 2008 by the Minot Heritage Singers, Voices of Note, and Dr. Joseph and Jackie Hegstad. Preference is given to full-time MSU music students that is a full-time participant in an MSU choral/vocal ensemble. A major or minor in music is not required. Selection is by the MSU Music scholarship committee. Mike Berg Memorial Scholarship--The recipient must participate in Band and Jazz Ensembles for the entire year. The recipient is determined by the judge at the MSU Jazz Festival. Minot Symphony Association and Symphony League Scholarship--Presented to outstanding woodwind, brass, percussion, or orchestral string students at MSU. Awards are based on performance ability and recipients must perform with the Minot Symphony Orchestra at all rehearsals and concerts. Music Division Scholarship--Awarded annually, this scholarship requires participation in choral and instrumental activities. Northwest Festival of Music Scholarship--Awarded annually, this scholarship requires participation in choral and instrumental activities. Petrucci Kiwanis String Scholarship--Scholarship for an MSU student who plays violin, viola or cello, or acoustic string bass. Awarded by the Minot Kiwanis Club in memory of Arturo Petrucci. The award is based on ability and requires performance with the Minot Symphony Orchestra at all rehearsals and concerts. Ralph Wallin Keyboard Scholarship--Scholarship for a qualified student in piano or organ. The recipient must be a keyboard major and study with a member of the keyboard faculty. Robert O. "Red" Wuttke Scholarship--Established from the estate of "Red" Wuttke to be awarded to music majors. Mr. Wuttke bequeathed his entire estate in December 1996, to Minot State University for music scholarships. Ruth Schell Overholser Fellowship--Established for the benefit of graduate students pursuing the study of music. Student must be enrolled as a graduate student in the Division of Music at MSU, demonstrate financial need, and academic achievement and maintain a GPA of 3.0. Ruth Schell Overholser Scholarship--Established by J. Spencer and Ruth Schell Overholser, this scholarship is awarded to a student who is at least a sophomore, is a resident of North Dakota and is enrolled as a full-time bachelor’s degree candidate in the Division of Music at MSU. A cumulative GPA of 3.0 is required and financial need and musical talent will be considered. Sally Thomas Violin Scholarship--Awarded to a violin student who is majoring or minoring in music, preferably a freshman who performs with the Minot Symphony Orchestra. Note: Students are advised to also apply for scholarships awarded by the Financial Aid Office (applications can be found on the Financial Aid Office web site). In addition, the Alumni Association offers scholarships for which there are special criteria and a separate application form available at their web site.